During the Easter season it’s practically impossible to find gifts that aren’t full of sugar and fat. From malted milk eggs to chocolate bunnies, it seems as if it has become the holiday of candy. However with a little creativity, there are several healthy alternatives for your Easter ideas. Rather than picking out a standard candy-filled basket at the store, consider giving the gift of a personalized Easter basket. Adults and kids both enjoy knowing the items in the basket have been chosen just for them. Making the arrangement yourself means the items in the basket are not only healthy but very fresh. There are several fun Easter ideas that are easy and will cost you about the same as one of those ready-made baskets sold by the dozens. The fun size candy bars and pastel wrapped chocolates can be tough to compete with when it comes to healthy alternatives for kids. But, not impossible. The colors, sweets, and snacks that kids love are all part of healthy, personalized Easter baskets. For starters, look for carrots with the leafy stem still attached. Local farmers markets and organic grocery stores have these. Kids love to chew on the carrots like their favorite cartoon bunny. Include single serving sized natural peanut butter and vegetable dip. Instead of jelly beans, try craisins and multi-colored raisins. They are just as tasty as jelly beans but are much healthier because they are packed with fiber. Include some trail mix by mixing nuts, sesame sticks, and sunflower seeds together. This power packed protein snack is great for active kids. Of course, another great source of protein is hard boiled eggs which are in abundance at Easter time. So definitely add those to the rest of the healthy snacks in the basket. 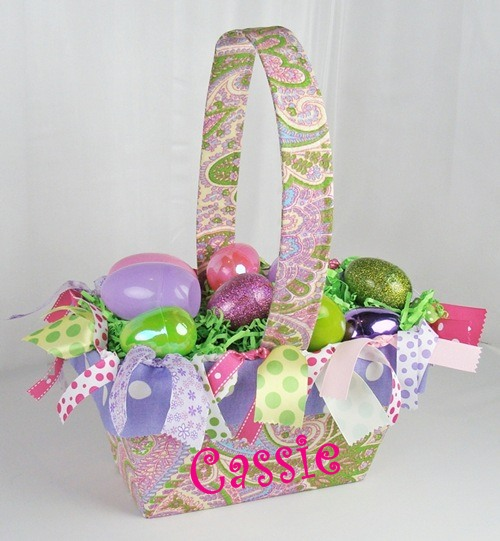 Throw in a stuffed animal or a little game and the Personalized Easter Baskets are complete. The kids will never miss the candy. Adults from the start are a little more receptive to healthy alternatives to Easter candy. They know they should be eating the “healthy stuff.” Help them stay on track with a personalized Easter basket full of healthy alternatives and delicious snacks. After all, swimsuit season will be here before they know it. Some Easter ideas can be as easy as filling the basket full of ingredients for the perfect salad. Include fresh herbs, healthy salad dressing, gourmet cheese, mixed nuts, and maybe even a few pears. Hard boiled eggs are perfect here too. The extra protein is perfect in a salad. Throw in a few seasonal flowers and your personalized Easter basket is complete. Your friends might even start eating more salads because they will surely have leftovers of the delicious ingredients. Encourage healthy living by proving salad is much more than lettuce! This entry was posted in Nutrition, Nutritional Information and tagged being healthy. Bookmark the permalink.